Starring: Michael Shannon, Jessica Chastain, Shea Whigham, Kathy Baker, Ray McKinnon, Lisa Gay Hamilton, Katy Mixon, Robert Longstreet, Guy Van Swearingen, Tova Stewart, Natasha Randall, Scott Knisley, Ron Kennard. Michael Shannon has surprisingly been around the acting game since the early 90’s. He even made a brief appearance in the Bill Murray comedy “Groundhog Day” in 1993 but it wasn’t until his scene-stealing Oscar nominated turn in the Leonardo DiCaprio/Kate Winslet film “Revolutionary Road” in 2008, that people took notice. Now, he’s getting regular work and on the evidence of his performance here, you can see why he’s in demand. Curtis LaForche (Shannon) is a blue-collar worker who lives with his wife Samantha (Jessica Chastain) and their young daughter (Tova Stewart) in the suburbs of Ohio. A series of strange shifts in the weather in the LaForche’s home town seem to signify impending disaster. Curtis quickly starts to kit out his storm shelter and stockpiling food but his paranoia soon frightens his family and alienates him from the town. Be prepared for a film that’s in no rush to tell it’s story. It demands patience and a level of commitment but if invested in, it pays dividends. Despite it’s glacial pace, this film had me captivated throughout. Credit must go to writer/director Jeff Nichols for his restraint and the trust he shows his audience. He confidently handles the material, in only his second film (his first was “Shotgun Stories” in 2007 – also with Michael Shannon). Dave Wingo also deserves mention for his haunting music score that adds to the sense of foreboding. Ultimately though, it’s Michael Shannon’s solid central performance that’s the real highlight here. His state of mind is always kept elusive. Is there a storm coming? Or is Curtis suffering from paranoid schizophrenia? Either way, something always feels just around the corner. Whether you believe him to be right or not, doesn’t matter, it still has you gripped and it’s testament to Shannon’s skills that he has you completely sympathetic, yet fearful. The moment he finally cracks in front of his family and friends is powerhouse stuff. The ubiquitous Jessica Chastain is no slouch either. She lends some fine support as his patient and bewildered wife, adding to the convincing family drama while the film maintains it’s uneasy feeling of dread. A provocative and nuanced film that leaves you with an uncomfortable feeling throughout. It manages to be both hopeful and frightening with a strong, memorable performance blowing in from Shannon. This entry was posted on February 20, 2012 at 3:47 pm and is filed under Drama with tags 2011. You can follow any responses to this entry through the RSS 2.0 feed. You can leave a response, or trackback from your own site. Nice review. I’m looking forward to this. I love Shannon and Chastain. It’s a powerful film. Shannon shows a great intensity and Chastain is everywhere these days (for good reason). 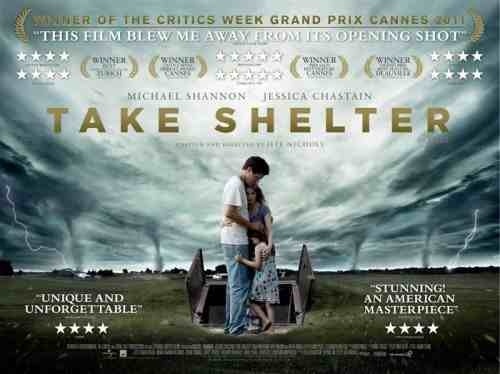 Take Shelter was incredible! Great write up! I loved this film man. It was excellent. I’m looking forward to seeing it again and I have a feeling I’ll like it even more. Check out “Shotgun Stories” if you liked this. It was the film that Nichols and Shannon done previous to this. I have a review in the index also.